What can a film with dual timelines offer to its viewer? Or better ask – how can someone so cleverly bring together two different plots, happening fifty years apart from one another, so that the story not only makes sense but touches our hearts? 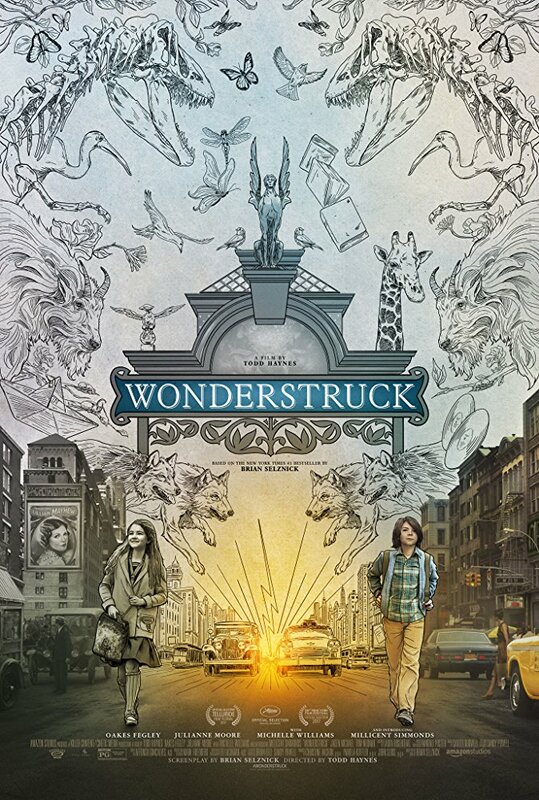 In “Wonderstruck” by Todd Haynes, based on Brian Selznick’s novel, who has also penned the script for this film, you will meet two kids – from different times, trying to find the mysterious connection with each other in this life. Rose lives in a wealthy family. Her story is taking place in 1927. Her father is going through a difficult divorce procedure that gets covered in media since his wife is a celebrity. Meanwhile, Rose often goes to the cinema to watch silent movies starring a famous actress portrayed by Julianne Moore. There is one crucial fact to know about our character – Rose is deaf. In 1967, Ben goes through even greater hardship in his life. He has lost his mother (Michelle Williams) in a car accident. During a storm, the lightning strikes Ben’s house. This event tragically deafens Ben as well. Now, both kids, who do not know each other and both are deprived of the ability to listen and talk, set on a journey to New York to uncover the meaning of their connection. The wonderfully written script and the subtle direction from Todd Haynes unfold the plot beautifully, telling the dual story of Rose living in New York, and Ben whose life occurs fifty years later. Despite that big gap, there is something mysterious about “Wonderstruck” – the book he finds that leads him to New York with one purpose in mind – to find his father. Ben becomes friends with Jamie – a boy who tries to help Ben. The two of them share an inspiring and unique connection. And then, great Julianne Moore who perfectly fits as Lillian Mayhew – a movie star from Silent Era, and who also appears as Rose – a woman from fifty years later, to connect all the dots. It’s not easy to describe “Wonderstruck”. I’d say it is a wonderland that you live in. As you watch the movie, you might find yourself drawn into an adventurous world from where you would not like to return to reality. Absolutely amazing performances delivered by Millicent Simmonds as young Rose, Oakes Fegley as Ben, and Jaden Michael as Jamie, prove once again, that the young actors are capable to bring much greater depth to their characters than we can imagine and they will do this quite masterfully. Looking at them, it’s easy to see why Todd Haynes has chosen these particular young actors to play his characters. Each of them manages to hold their scenes on a top level. In conclusion, “Wonderstruck” is a profound film with a very deep and touching subject. The actress playing Rose is deaf, which brings more reality to the film. Overall, this is a well-adapted novel that deserves everyone’s attention on the big screen. It’s an excellent reason to escape the real world and yet gives us another reason not to want to be back to the world where we live now. And, in the very end, my compliments to Todd Haynes. I wish I knew how to handle a complicated material and to have the skills to turn it into an easygoing film such as this one.